No matter how many of these attractve bracket fungi you see, there will always be another Stereum hirsutum with significantly different coloration. The variability of this fungus makes its identification at first rather difficult. 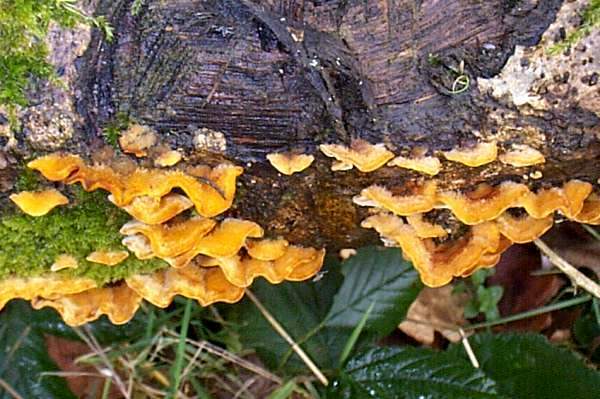 Stereum hirsutum is common and widespread throughout Britain and Ireland. On mainland Europe this crust fungus is found from Scandinavia right down to the Mediterranean region. There are also reports that the Hairy Curtain Crust fungus is found throughout North America, and indeed this must be one of those truly international fungi, being considered native to many southern hemisphere countries including Australia. The Hairy Curtain Crust fungus was described in 1787 by German naturalist Carl Ludwig von Willdenow (1765 - 1812) who gave it the scientific binomial name Thelephora hirsuta. It was British mycologist Samuel Frederick Gray (1766 - 1828) who in 1821 transferred this species to the genus Stereum, establishing its currently-accepted scientific name as Stereum hirsutum. 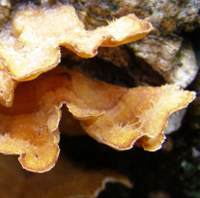 Synonyms of Stereum hirsutum include Helvella acaulis Huds., Auricularia reflexa Bull., Thelephora hirsuta Willd., Boletus auriformis Bolton, and Auricularia aurantiaca Schumach. 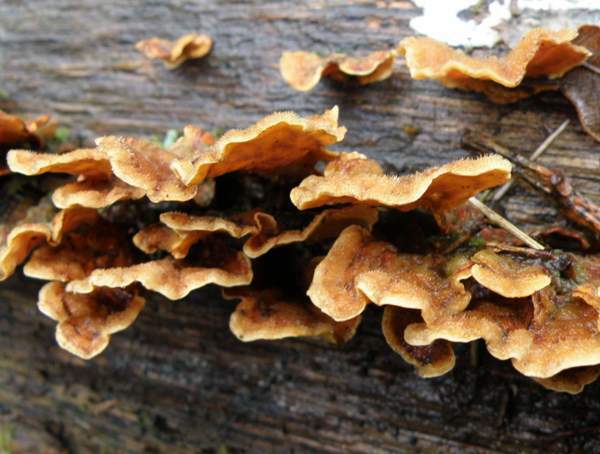 Stereum, the generic name, means tough, and crust fungi in this genus certainly can be difficult to tear when you want to take a small sample for investigation. The specific epithet hirsutum means hairy (hirsute, indeed! ), and the upper surfaces of these irregularly-shaped tiered brackets are distinctly hairy when the fruitbodies are young and fresh; however, they do become smoother with age. The common name Hairy Curtain Crust reflects (in the 'curtain' part) the rippled form of edges of the fruitbodies, which do look like partly-drawn curtains; however, it's very much more common to see this species growing in the form of tiers of reflexed crusts or brackets, particularly on standing dead wood, than as resupinate crusts (although the latter form does occur, and I see this most often on the ends and vertical faces of stacked sawn timber). Individual brackets are 2 to 8cm across and have irregularly wavy edges. The colours, which are zoned and generally paler towards the margin, darken with age and vary considerably with location, but yellow, orange and brown are most common. There is no stem. 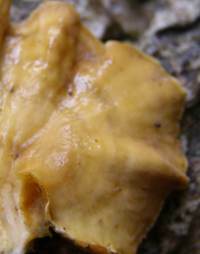 The lower spore-bearing surface is smooth, without pores, and rather paler than the upper surface; it is less distinctly zoned. The flesh is 0.5 to 1mm thick. Ellipsoidal, smooth, 6-7.5 x 3-3.5µm; amyloid. No noticeable odour; tough and tasteless. Saprobic, on dead hardwood trees and fallen branches, particularly oaks and Beech; very occasionally seen on conifer timber. All through the year, but shedding spores in autumn. 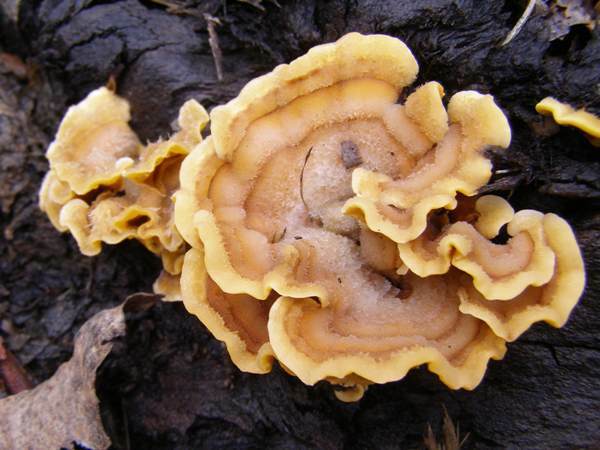 Stereum subtomentosum has an upper surface that is zoned in various shades of greyish-orange or greyish white. There is no stem, but the attachment region is usually much narrower than that of Stereum hirsutum. 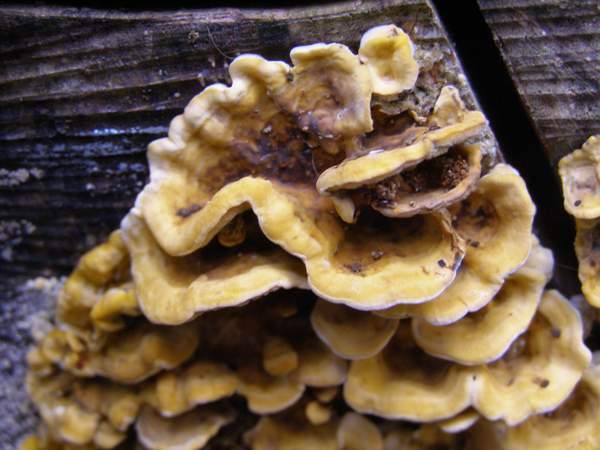 These tough and leathery, tasteless fungi are inedible and of no culinary value. Pat O'Reilly (2016). Fascinated by Fungi, First Nature Publishing.